It seems the Red Aligatorz have been let out of the asylum for another evening. This time they will be playing in Penrith/Cumbria on Friday, the 7th of December 2018, at The Warehouse. It has been many years since the Gatorz have strummed or slapped their way through a set in the Cumbrian market town, and the place is still a hip and trendy place to be, besides that. With it being close to the Lake District and all the new punters who are making it their watering hole for a night, weekend, or to set up home there to be close proximity; yes Penrith is the place to be on the 7th December. The last time we played in Penrith we were doing a gig in a night club called “Blues” there is a very surreal video on the blog where the camera man (Mr. Blues himself) starts to turn himself upside down, they still talk about it in Penrith, I am told! This gig will be in another happening nightclub called, The Warehouse, and it will be the last gig before it moves on to Newcastle (I believe) so get yourself there. Not only are the Aligatorz playing, but 2 other bands are on stage. 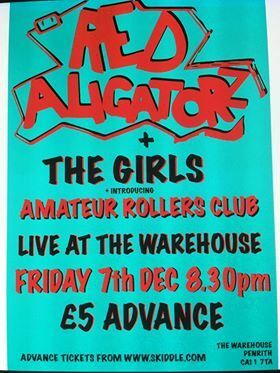 The Girls, and The Amateurs Rollers Club, will be performing; so it should be a lively and interesting experience. Kick off starts at 8.30pm and it cost £5 for a ticket in advance and £5.000 on the door (I kid you not) so you better run out and get one before you have to sell your house, kids and teeth just to be there.